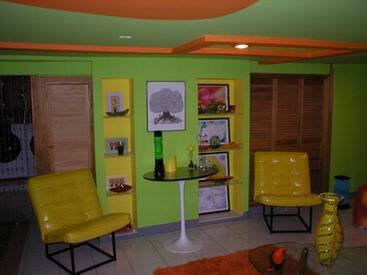 Flashback to 70's retro decor - It doesn't get any funkier than this! It Doesn't Get Any Funkier Than This! My fiancé and I collect antiques. I always went to estate sales and was attracted to those 70's ashtrays. The colors and shapes were intriguing. My fiancé collected lava lamps and had a funky retro table that his mom purchased at a garage sale. I am such a simple person and only like white walls. I would say it is hereditary. Everything was always white in my mom's house. I really liked the retro 70's era so we decided to go for it. It took me sometime to give him the ok, to paint another color but I got daring. Kevin taped the wall and asked for my approval and I said it was perfect. I was extremely happy with the outcome. The couch and chairs I won on Ebay. 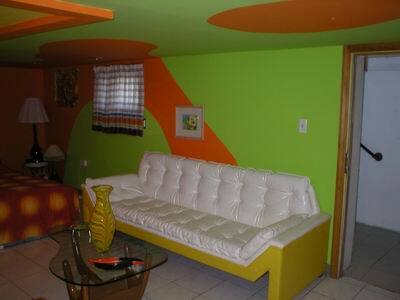 They fit the room so perfect, believe it or not the couch was rarely used and was made in 1970, I just had to have it. Kevin's sister won the auction and I could not thank her enough. The furniture completed the room. 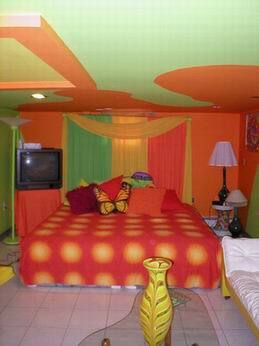 1) Retro Bedroom Furniture Is A Look That Is Truly Groovy!